Civic culture needs to be re-imagined. This is no call for a new ideology. It’s much rather a plea to look once more, closely, at the energies that animate and electrify the exchanges between people. Traditionally, art had a vital role to play in this regard as it partook in the processes bringing colour to the city. During Renaissance times, the trade in pigments and binding agents was at the heart of urban economies, fuelling art, fashion and medicine alike. Colour was close to political power. Around 1500, Rome tried to ban imports from the Eastern Mediterranean to build a monopoly on binding agents. The Venetian trade network, at the time including Cyprus, was impossible to shut down and relentlessly broke the embargo. Not only does Venetian painting flourish in the moment. It also channels, and still radiates with, a particular kind of optimism and wisdom. 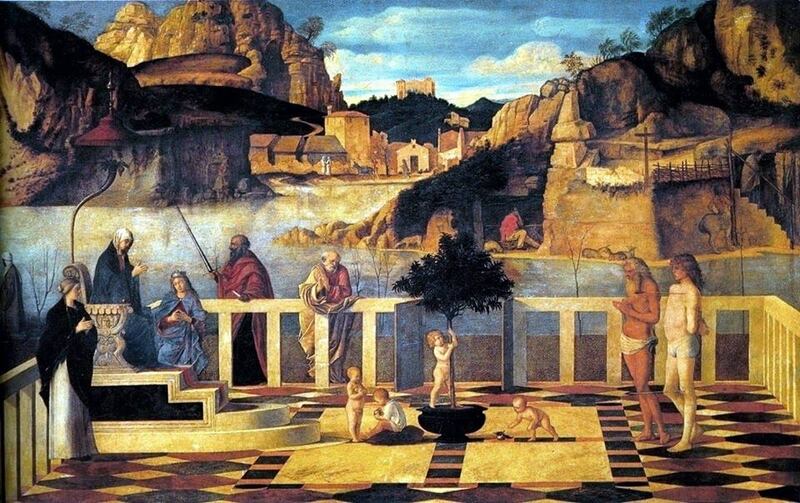 Look at Giovanni Bellini’s allegories. They show civic space, created and inhabited in a peculiar spirit of animated coexistence. The emancipatory thinking to which Bellini gave the living colours of painting had revived the ties to an alchemical understanding of how people, planets, creatures and things in the world relate. Colour was a medium thought capable of activating these relations, in painting, fashion, and make-up alike. So was music. Thinkers like Marsilio Ficino proposed ideas on the generative relational powers, i.e. magic). Their influence is vividly present in Bellini’s vision of an (artistic/intellectual) public that freely gives itself space, time, rhythm and rhyme. Arguably, imperial modernity did atrocious damage to this space, ousting the deep magic grasp of colour and rhythm as unscientific, uncivilized, witchery. Still, this embargo on the knowledge of living colour too was broken. Many urban modernists attuned to the old arts would not just paint but dress in the colours they gave to the city, as, they danced to a different drum. The talk will take a walk across different spaces and times to speculate upon what living colour, rhythm and rhyme may have given to cities to set the mood and stage for free exchange. Jan Verwoert is a critic, writer and academic on contemporary art and cultural theory, based in Berlin. The talk will be in English, with simultaneous Greek translation. This is the first public event of the Cyprus Pavilion – Biennale Arte 2017. The 57th edition of the event, directed by Christine Macel, will take place between 13 May and 26 November 2017 (Preview 10, 11 and 12 May).